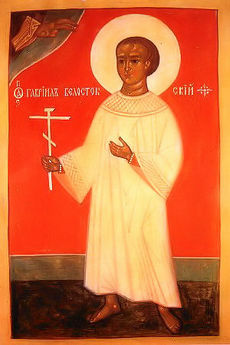 Icon of Child-Martyr St Gabriel of Białystok (†1690). The holy Child-Martyr Gabriel of Białystok, also Gabriel of Zabludov, Gabriel of Slutsk, or Gabriel of Poland ((Russian): Гавриил Белостокский), March 22, 1684 - April 11, 1690, is a 17th-century Belarusian saint who was killed when he was only six years old, and is now regarded as a patron saint of children and youth. The church commemorates his feast day on April 20 / May 3, while the translation of his relics in 1755 is held on May 9 / May 22. In addition, the translation of his relics back to Bialystok in 1992 is commemorated on September 22. The holy Child Martyr Gabriel was born on March 22, 1684 in the village of Zvierki,[note 1] near Zabludov. He came from a pious Orthodox family, and his parents Peter and Anastasia Govdel maintained the faith of their ancestors in a difficult period for Orthodoxy, when Uniatism was becoming the dominant religion in this region. Gabriel was baptized in the Dormition church of the Zabludov monastery and received the name Gabriel in honor of the Archangel. As a child Gabriel was unusually distinguished from other children, enjoying prayer and solitude rather than children's games. On April 11, 1690, a terrible tragedy visited the Govdel family. His unsuspecting mother, leaving the six-year old Gabriel alone in the house, had taken some food to his father who was out plowing the fields. While she was gone a local tenant came to the house. Taking advantage of the parents' absence and the child's trusting nature, he kidnapped the boy. Gabriel was taken secretly to the town of Bialystok and given over to sadistic torture. His side was pierced and a special instrument was inserted which gradually drained his blood. After nine days of such treatment the boy died. Desiring to conceal his crime, the murderer secretly took the body and threw it onto the edge of a field near some woods in the vicinity of the boy's home village of Zvierki. As the holy Feast of Pascha approached, hungry dogs began gathering around the lifeless body, and predatory birds circled overhead. Miraculously however the body remained untouched. Not only did the dogs refrain from devouring it, but they even guarded it diligently against the birds. The body of the young martyr was discovered and taken to Zabludov. An investigation brought to light the particulars of the crime which was duly entered in the town records. With the participation of many local inhabitants, deeply shaken by the committed atrocity, the body of the martyr Gabriel was laid to rest near the cemetery church. There it remained for close to thirty years. Relics of Child-Martyr Saint Gabriel of Białystok, at the Orthodox Cathedral of St. Nicholas in Białystok. Around 1720 the whole territory surrounding Bialystok was seized by an epidemic. Thousands fell victim to the disease and filled the cemeteries. Many children from the neighborhood of Zvierki and Zabludov were buried near the grave of the child-martyr Gabriel, whom many revered on account of his innocent suffering and martyric death, and many sensed an abundance of grace present at his grave. One day during a funeral, the Martyr's grave was accidentally disturbed and His body was dug out. When it was opened witnesses were astonished to see that after the passage of so many years, the child's body was incorrupt. News of the miracle spread with lightening speed among the faithful, strengthening and increasing veneration for the holy child. The end of the epidemic and many healings are connected with this event. His relics were then reverently transferred to the village church in Zvierki and placed in a special crypt below the church. In 1746, as a result of fire, the church was completely burnt down; however the body of St. Gabriel was saved. His partially burnt hand was miraculously healed and covered with skin. 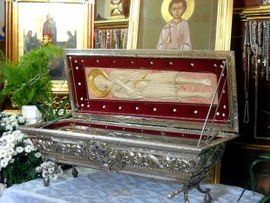 After the fire, the relics of Saint Gabriel were transferred to Zabludov. And in 1755, the relics were transferred to the Holy Trinity Monastery in Slutsk. His cult developed and spread throughout the Russian Empire, and the boy was canonized in 1820. The living memory of the child-martyr and the desire to promote his veneration inspired the building of a church on the site of his grave. On the day of Holy Pascha 1894 the festive consecration of the church took place. Sadly however, only eight years later this church also burned down. But a miracle occurred on this occasion as well, and although the church was completely destroyed, the icon of its heavenly patron, the child-martyr Gabriel, was preserved unharmed. Just before the First World War the relics came back to Białystok, to St. Nicholas Cathedral, from where they were transferred to the Supraśl Orthodox Monastery. During the First World War the relics were again returned to Slutsk (Belarus). After the Monastery of Holy Trinity (Slutsk) was liquidated by the communist authorities, the relics were transferred to Minsk (Belarus), and then to Grodno (Belarus) in 1944, where they remained until September 21, 1992. During September 21-22, 1992, with the blessing of the Archbishop of Bialystok-Gdansk Sawa, as well as with the blessing of the Bishop Valentin of Grodno and Volkowyck (and Metropolitan Filaret (Vakhromeev) of Minsk and Slutsk), the relics of Saint Gabriel were festively transferred from Grodno back to St. Nicholas Cathedral in Białystok, where they are the focus of pilgrimages. partake of thine eternal inheritance." ↑ The village of Zvierki was a Belarusian town at the time, but is now in Polish territory. ↑ 1.0 1.1 1.2 1.3 1.4 1.5 1.6 1.7 1.8 1.9 LIFE OF SAINT MARTYR GABRIEL. BIALYSTOK-GDANSK DIOCESE of the POLISH AUTHOCEPHALOUS ORTHODOX CHURCH. Retrieved: 2012-01-20. ↑ 2.0 2.1 2.2 Great Synaxaristes: (Greek) Ὁ Ἅγιος Γαβριὴλ ὁ Μάρτυρας. 20 Απριλίου. ΜΕΓΑΣ ΣΥΝΑΞΑΡΙΣΤΗΣ. ↑ 3.0 3.1 Childmartyr Gabriel of Bialystok. OCA - Feasts and Saints. Retrieved: 2012-01-20. ↑ April 20/May 3. Orthodox Calendar (PRAVOSLAVIE.RU). ↑ May 3/April 20. HOLY TRINITY RUSSIAN ORTHODOX CHURCH (A parish of the Patriarchate of Moscow). ↑ May 22 / May 9. HOLY TRINITY RUSSIAN ORTHODOX CHURCH (A parish of the Patriarchate of Moscow). ↑ Complete List of Saints. Protection of the Mother of God Church (POMOG). ↑ 8.0 8.1 8.2 8.3 8.4 8.5 8.6 Child Saint of Poland – Martyr Gabriel of Zabludov - April 20. ROCA - Orthodox America. Retrieved: 2012-01-20. ↑ Gavriil of Belostok. Wikipedia. LIFE OF SAINT MARTYR GABRIEL. BIALYSTOK-GDANSK DIOCESE of the POLISH AUTHOCEPHALOUS ORTHODOX CHURCH. Retrieved: 2012-01-20. Child Saint of Poland – Martyr Gabriel of Zabludov - April 20. ROCA - Orthodox America. Retrieved: 2012-01-20. Childmartyr Gabriel of Bialystok. OCA - Feasts and Saints. Retrieved: 2012-01-20. (Russian) Святой Гавриил. Belarusian Orthodox Church. (Greek) Great Synaxaristes: Ὁ Ἅγιος Γαβριὴλ ὁ Μάρτυρας. 20 Απριλίου. ΜΕΓΑΣ ΣΥΝΑΞΑΡΙΣΤΗΣ. This page was last edited on October 23, 2012, at 20:20.